During a spell of boredom I was scrolling over an old Ordnance Survey map of Dartmoor when I spotted an wooded oval feature which was labelled as ‘Camp (site of)‘. Today the landscape feature is labelled as a ‘Settlement‘ by the OS. This is situated in the enclosures of Archerton and although having visited the area on many occasions it was one that had never commanded any attention. I bet I am not the only person to have overlooked this innocuous round wood and not realised what lay beneath its leafy bowers. So a bit more investigating was needed and a visit to the English Heritage Pastscape website turned up the following description of the camp: “An Enclosed Settlement of probable Prehistoric or Roman date consisting of an enclosure and hut platforms seen as rubble walls. Scheduled.” Well that was none to helpful especially as there is scant evidence of the Roman settlements anywhere near Dartmoor let alone on it. Perhaps some of the old Dartmoor topographical tomes would be a tad more informative? In 1848 Samuel Rowe notes the following; “The remains of a singularly formed elliptical enclosure can be traced, with an entrance on the south-east, where the oval outline, instead of being continuous is bent into two circular sweeps, between which, apparently, was the original entrance to the enclosure. Within are vestiges of tracklines and the ruins of an aboriginal hut, where not only the formation but the remains of the walls are still to be seen. The planting of trees, the growth of vegetation, and the gradual accumulation of what in time makes soil, has obscured the main features of the enclosure.“, p.196. The site was then visited in 1891 by one Arthur B. Prowse who remarked that since Rowe’s visit the; “remains have become more ruinous,”. He also observed two defined circular spaces which had a diameter of between fifty and twenty four yards. Prowse concluded that there was distinct evidence of nine hut circles within the area with a much larger one outside the enclosure. pp. 311 -312. There actually was a sketch plan of the enclosure included with Prowse’s paper for the TDA but unfortunately it is not available online. Around about the same time J. Ll. W. Page also inspected the settlement when he considered that the feature was in fact a pound into which; “the flocks and herds of the aborigines were driven at night to seek shelter from the prowling wolf.“, p. 168. Turning to more modern writers, Hemery just casually refers to a “Round Wood,” and nothing more and surprisingly Butler makes no mention at all of the feature. In 1979 and 1990 English Heritage Field Investigators paid much more attention to the settlement. The biggest problem they found was that the beech trees had not only obscured the feature but caused a great deal of damage to the remains. This factor was compounded in 1990 when the infamous gales of that year blew many of them down. If that was not enough recent felling operations had caused further destruction. Another factor in the destruction was that much of the original building stone had been robbed sometime in the nineteenth century to build new enclosure walls. The settlement is in fact a scheduled monument (No. 1002636) for what good it has done. But who was initially responsible for planting the trees in the first place I have been unable to ascertain. However, Bellamy states that Archerton House was first built by one J. R. Bennett, p.13., and the trees were in-situ by 1848 when Samuel Rowe inspected the monument. So maybe the finger of the future destruction should be squarely pointed at Mr. Bennett? Possibly a case of shutting the stable door after the horse had bolted the monument was placed on the ‘Scheduled Monument At Risk Register’ in 2015. Its entry clearly states that its condition is; “generally unsatisfactory with major localised problems.” The principle vulnerability being forestry and a trend of declining condition. I did enquire at the Dartmoor National Park Visitor’s Centre as to whether or not the authority had any plans for the monument and the information officer was unaware of any. What the Field Investigators were able to establish was that despite none of Prowse’s suggested hut circles were clearly distinguishable some elements and positions could be identified. These came in the form of platforms and wall fragments. It was impossible to ascertain the original dimensions of the settlement wall but a low turf covered bank spread measured between four and eight metres. Inside the enclosure on the western side are platforms and pieces of platforms which were thought to be the locations of some of the nine huts suggested by Prowse, Pastscape Online Source – HERE. I suppose it should be no revelation that such a monument should be located so, especially when the surrounding landscape is considered. A quick glimpse at the OS map reveals a whole host of Bronze Age features dotted around the area. It would have been as Prowse called it a veritable Dartmoor Metropolis. It is a great shame that the ‘Archerton Camp’ has been so badly mutilated by both man and the Dartmoor weather. So next time you are driving along the B3212 don’t worry about the ‘Hairy Hands‘ just cast your eyes over to the small round wood and think what once stood there. Please note: Archerton Camp sits on private property and access is denied without the owners permission. Bellamy, R. 1998. Postbridge – The Heart of the Moor. Tiverton: Halsgrove Publishing. Page, J. Ll. W. 1895. 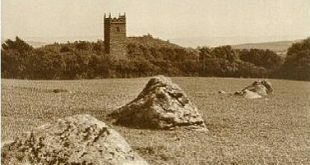 An Exploration of Dartmoor and Its Antiquities. London: Seeley & Co.
Prowse, A. B. 1891. The Ancient Metropolis of Dartmoor. Transactions of the Devonshire Association. Vol. XXII. Rowe, S. 1985. A Perambulation of Dartmoor. Exeter: Devon Books.